the half century of their existence. as well as live performance footage. 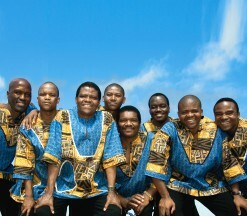 South Africa’s beloved Ladysmith Black Mambazo (LBM), the Grammy-winning isicathamiya group, have embarked on a countrywide tour to celebrate their 50 years together. Isicathamiya (from the Zulu word meaning “to walk softly”) is a style of singing that focuses on deft harmonising. Isicathamiya choral competitions are popular in South Africa. The Back to eKasi (slang, meaning “home”, from the Afrikaans word lokasie, meaning “township”) tour sees the globe-trotting group going back to their roots and taking their unique a cappella sound to townships around South Africa between 16 and 24 September 2010. Fans in Bloemfontein, Thokoza in Ekurhuleni municipality, Rustenburg North, Atteridgeville, Ermelo, Bela-Bela and KwaMashu near Durban are in for a treat, with performances from LBM and two local curtain-raisers at each venue. All seven concerts during the nine-day tour are free. The eKasi tour also celebrates the youthful LBM founder Joseph Shabalala’s 70th birthday on 28 August, as well as a decade of South African-Norwegian cultural collaboration through the funding organisation Mmino, which works exclusively with music projects. Because of this milestone, Norwegian singer Kristin Asbjørnsen will also take the stage with the distinguished vocalists. Tor Christian Hildan, Norwegian ambassador to South Africa, said that music was the core of the two countries’ cultural cooperation. “We share common values and see the importance of music in cross-cultural communication as a powerful tool to address demanding social, economic and political issues,” said Hildan. A singer and composer, Asbjørnsen works with the musical ensembles Dadafon and Krøyt, and is also a member of the experimental vocal quartet Kvitretten. The tour is supported by, among others, Gallo, LBM’s South African record company, and the National Arts Council (NAC), based in Newtown, Johannesburg. “We congratulate uBaba [a term of respect] Shabalala on his 70th birthday, Ladysmith Black Mambazo on its 50th, and Mmino, our own child, on its 10th,” said NAC CEO Annabell Lebethe. The triple Grammy winners – in 1987, 2004 and 2009 – have performed and collaborated with the world’s best, including Paul Simon, Dolly Parton, Sarah McLachlan, gospel veteran Mavis Staples, and many more. It was Simon who, in the mid-1980s at the height of the international cultural boycott of South Africa, defied the ban to work with a group from that country, and the result was the iconic Graceland album, which rocketed LBM to international stardom. In 2006 they worked with pop sensation Josh Groban on his album Awake, appearing in two songs, Lullaby and the classic South African protest song Weeping. They also performed live with Groban in the US on the Awake tour. Joseph Shabalala, then a factory worker, founded the group in 1960, basing its style on gospel music and traditional African harmonies. He had just converted to Christianity, an event that played a big role in LBM’s musical direction, but he has always emphasised that their message is not meant for any one religious group. LBM is very much a family affair, with the original line-up comprising members of the Shabalala and Mazibuko families. Today there are five Shabalalas and two Mazibukos in the group, with a Dlamini and Mthembu as well. In the five decades since, LBM have gone on to achieve international fame and acclaim. 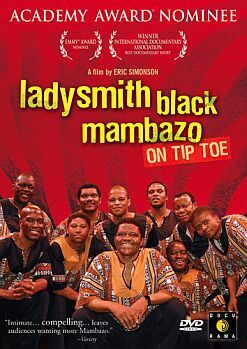 While their 13 Grammy nominations have yielded three wins, there has also been a host of other nominations, including Emmys, South African Music Awards, and an Academy Award nod in 2001 for the short documentary titled On Tip Toe: Gentle Steps to Freedom. As individuals and as a group, LBM have been consummate international ambassadors for South African culture, but their global popularity and success has meant that fans at home often miss out on performances. This makes the eKasi tour all the more special.